It’s been a while since I’ve done a product review, but this light fixture/bulb/ballast combination was so intriguing that I felt compelled to write about it. Most reviews of lighting over the past few years have focused on scientific measurements and statistical analysis. It’s certainly important to understand the PAR value of a particular bulb or bulb/ballast combination, but it’s equally important to consider the practical aspects as well. 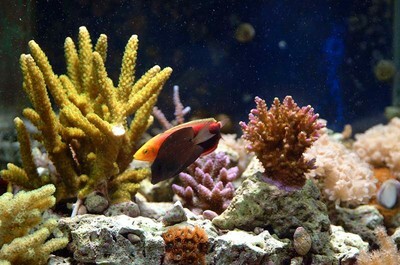 Many aquarists keep their aquariums in general living spaces, so aesthetics is an important consideration. 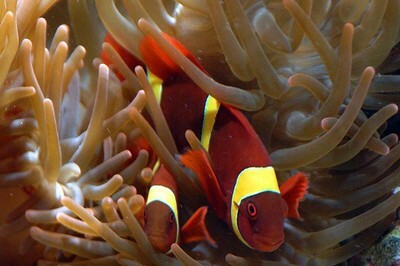 Most aquarists are on a budget when it comes to lighting choices, so the question of value for the dollar is a concern. Finally, a bulb or light fixture can look great on paper, but the real question is how does it work over a real aquarium? In other words, how do the corals appear? Do they grow under this particular light/reflector/ballast? Do they hold their “color?” How does the bulb hold up over time? These questions are sometimes best addressed in real world tests over time. 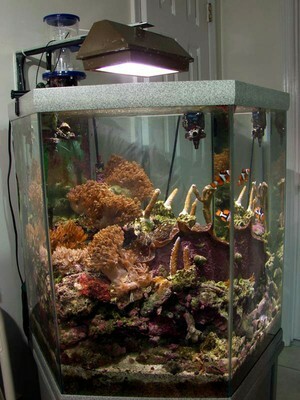 I’ve been toying with different lighting fixtures over my 42 hex reef aquarium for many years. I’ve never been totally satisfied with the choices I’ve made in that time. My first fixture was a stationery 150 watt metal halide pendant clad in brown aluminum. It held a double-ended bulb (AKA “HQI”) and employed a dimpled aluminum reflector. It performed well, but I was never satisfied with it. Since it was affixed to the wall, I couldn’t adjust the height of the fixture. This made it difficult to change bulbs and clean the tempered glass lens. I was also unable to raise the fixture after replacing the bulb. 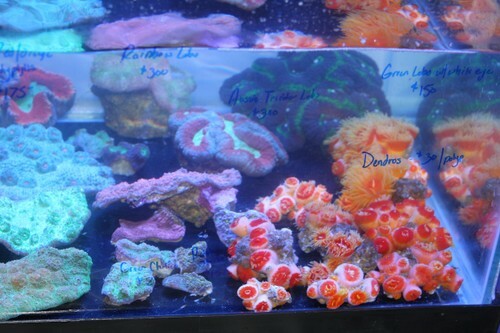 Many corals cannot adapt to a sudden increase in light when replacing an aged bulb. 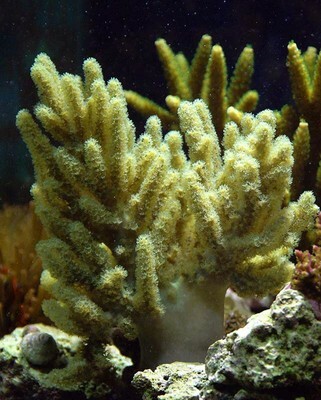 This may result in coral “bleaching” or an expulsion of their zooxanthellae, which often leads to the death of the coral. Ideally, you want to raise the fixture after replacing the bulb and gradually lower it over a period of time. 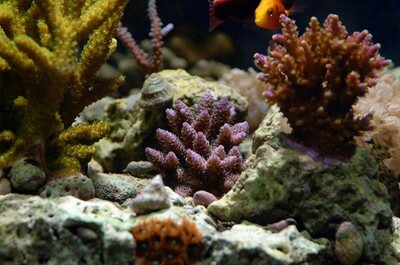 This allows the corals to slowly adapt to the increase in light. This fixture also became red-hot after a few minutes, and I was burned more than a few times while performing tasks in and around the aquarium. My last issue involved the ballast. It was a large heavy box that got extremely hot. I couldn’t hide it under the stand because it would heat the tank by a few degrees over the course of a day. I was forced to sit in on the floor behind the aquarium, which was unsightly and made it susceptible to damage from water spills. I later swapped this pendant out for a smaller and lighter fixture but I was not satisfied with the light spread over the aquarium. 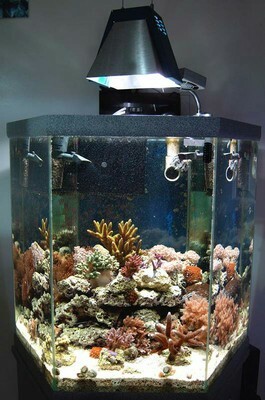 It’s difficult to cover hexagon and square-shaped aquariums with traditional rectangular pendants. 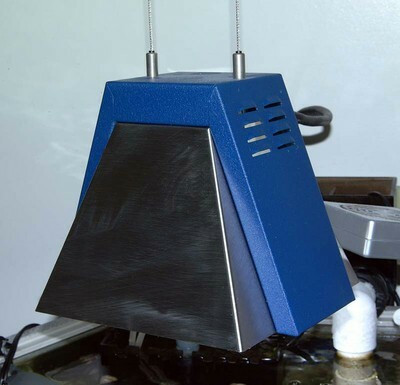 When Andy Howard of IceCap, Inc. showed me this radical new stainless steel fixture and the accompanying double-ended metal halide bulb built into a mogul-based reflector, I was anxious to try it over my 42 hex reef aquarium. From an aesthetic viewpoint, I find this fixture very attractive. I like the shape, size and color. I like the fact that the height is easily and infinitely adjustable by simply pulling and pushing the steel cables. I also appreciate the quality of the fixture. It’s constructed of brushed stainless steel and has held up well over a six month period. The fixture itself simply functions to hold the bulb and vent some heat. 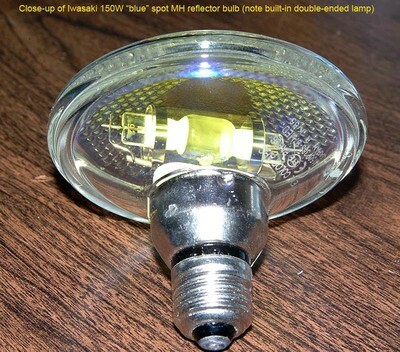 The bulb is not enclosed in the fixture and most of the heat is directed away from the housing. It does get hot, but never scalding and, since it’s freely hanging, it’s simple to push out of the way if I need to work in the aquarium. The fixtures measures approximately 6.5″ high and 8.5″ at the widest bottom dimension. As for the reflector, it’s built into the bulb! Iwasaki has managed to mount a double-ended metal halide bulb horizontally into a PAR36 reflector flood lamp! It’s a clean and efficient design. All the light is directed straight down in a fairly tight pattern. There is no loss of light outside the aquarium. 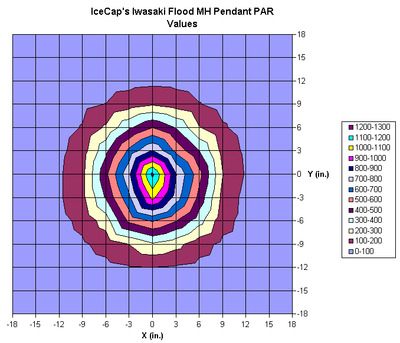 This is clearly demonstrated in Sanjay’s accompanying views of the PAR plot at a distance of 9″. Further information on the light spread or beam angles can be found on Iwasaki’s web site (http://www.eyelighting.com/ss/EQS-N-52-84-00006.pdf). These new lamps come in 70 and 150 watt versions, with blue and daylight (6500K) color temperatures and PAR36 and PAR38 configurations. 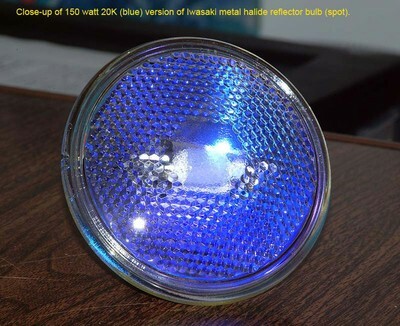 You can see detailed specs here: http://www.eyelighting.com/colorarc_par.html. After experimenting with the various configurations over my 42 hex reef aquarium, the corals and I determined that we liked the 150 watt 6500K PAR36 lamp best (M150P36FD/MED-R 6500K 150W Flood). It offers the best combination of light spread, appearance and intensity. The color is bright white, as evidenced by its 6500K color temperature and CRI of 96. The real proof came when I moved numerous Zooanthid and Acropora frags from my 500 gallon reef aquarium into the 42 hex reef aquarium. To my surprise, half of the Zooanthid frags bleached while the colors on the Acropora frags intensified. These frags had come from approximately the same distance from the bulbs in the large reef aquarium, except I use 400 watt Ushio, XM and Iwasaki metal halide bulbs in that tank! I’ve also been pleased that the colors on the Acropora corals have held up over time, which indicates that the bulb hasn’t lost much punch over 6 months time. 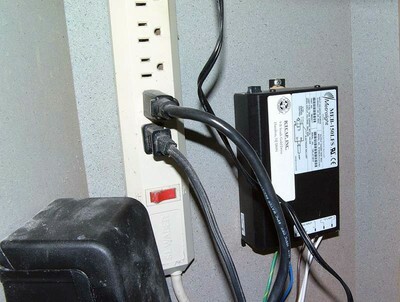 The bulbs are reported to last 2 years when used in conjunction with the electronic ballast. I can’t attest to that yet, but even after 6 months, I have not been able to acclimate many of the Zooanthid colonies to the higher intensity light field. I had to move them off to the sides and bottom of the aquarium where they’re doing well. 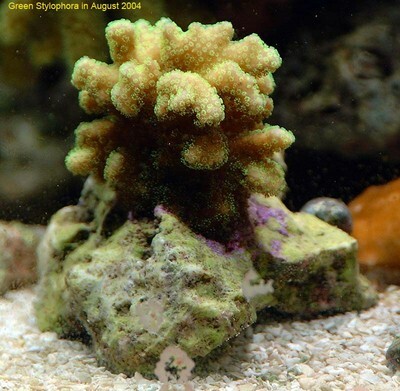 Growth on the SPS coral frags has been equally impressive. 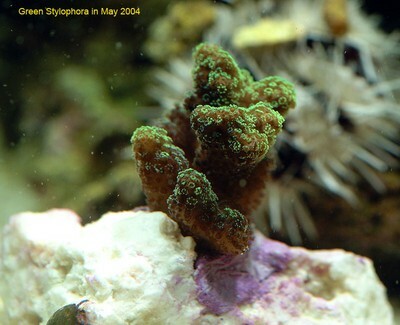 One frag from a blue Acropora millepora coral has outgrown the mother colony in 6 months time. The other piece of this combination is the ballast. I’m using IceCap’s 150 watt electronic ballast. I have long-term experience with this ballast since I’ve used it on another aquarium for the past 18 months as well. It’s small (fits in the palm of your hand), lightweight, quiet and barely gets warm to the touch. I’m able to mount it safely out of the way on the inside wall of my aquarium stand with no concern for heat buildup. It’s a major improvement over the cinderblock griddle that I used previously.